Jim finds a letter of Ewan's on the floor. Beverly goes mental when he confronts her. Beverly storms off to her room while Helen comes out to find out what's going on. HELEN: Jim, what is happening? JIM: She's having an affair. With Ewan O'Brien! Helen doesn't believe it, but Jim shows her the letter that he found on the floor. It's only one page of the letter, but it's enough to tell. Helen still can't believe it - Beverly told her that Ewan was just a friend. HELEN: Jim. If you're wrong, think of the damage you can do to your marriage. Harold is getting ready to go back to the Coffee Shop. Madge is suffering from the post-holiday blues a bit, but she is glad to be home. Just then there's a knock at the door - it's Melanie, with a bunch of flowers to welcome them back. Apparently Des has had to go away - he's got the job he wanted after all, so he and Jamie have gone to Perth to set up a new branch. 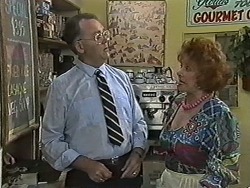 Melanie tells Harold that the Coffee Shop has been very popular since Gloria took over and the profits are up too! Harold doesn't look too chuffed to hear this. Beverly gets up and completely blanks Jim. 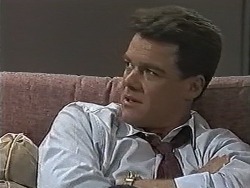 Jim has slept on the sofa while Helen tells him off. She says she wouldn't have come back if she thought she was coming into a war-zone. In the kitchen, Helen tells Beverly off for not setting Jim straight - if she's not having an affair, she should say so. Beverly admits that the letter is ten years old - but she didn't tell Jim because he must have dug out her correspondence. But Helen tells her Jim found the letter on the living room floor. Beverly looks contrite, but says that Jim jumped to conclusions too. 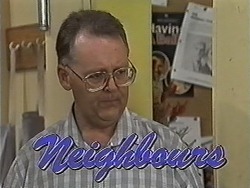 Helen tells Beverly that she must talk to Jim. Beverly says she'll do it later, after surgery. Gloria hugs Harold in welcome. She shows Harold her specials board and he isn't pleased at the meat content. Beverly is peeling onions when Jim comes in, so it's hard to tell if she's crying because of them or because of her marriage troubles. Jim says he thinks it's possible for Beverly to meet someone else, but he also thinks she'd tell him. Beverly admits that the letter is ten years old. BEVERLY: Why do we give each other such a hard time? Jim asks why Beverly had the letters out - she says she was just nostalgic for her university days. She's a hoarder and keeps things. JIM: Would you throw the letters away? BEVERLY: Would you make me? JIM: Oh, I know I'm being unfair. I know that. But I can't help feeling that I'm competing with the past. He gets up and walk out of the room. Gloria greets Madge who has come in. Harold looks wrecked after lunch-time rush, but he insists he's fine. 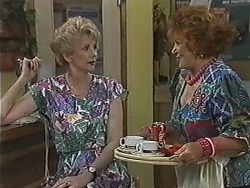 Madge suggests they go home and leave Gloria to it. When Gloria is in the kitchen, he rants to Madge that Gloria has lowered standards in the Coffee Shop! In the kitchen, Harold discovers some alcohol in the cupboard. She covers and says they're for cooking with, but Harold says she'll have to do without them in the future. Caroline and Christina are dressed identically and are doing each other's hair. Kelvin arrives - he's got new contact lenses! Paul comes in and Caroline immediately goes into Christina mode and vice versa. Paul is confused and mixes them up. They smile triumphantly at each other. Beverly has got a potential sponsor coming to dinner tonight. Ewan is also there. The three of them immediately start talking business and Jim looks fed up. Melanie, Kelvin, Paul and Christina are eating dinner while Caroline does the serving. Paul still reckons that he can tell Caroline and Christina apart by their personalities - it doesn't matter what they're wearing. Body language is a dead give away and so are speech inflections. Finally they confess. Paul thinks it was a cheap trick and is not amused. Paul is suspicious about the twins now - whether they've pulled the same trick at work! (but they haven't). The twins tell Melanie that Kelvin is much improved - he's not so clumsy anymore. Melanie says it's like tending a weed - giving it love can bring out the best in it - and Kelvin! A bloke is drinking a beer at a table. 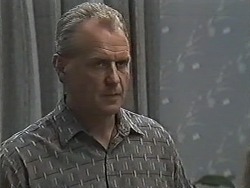 Gloria goes over to tell him off before Harold sees him. She takes the beer of the bloke, but when he protests, agrees he can have one if he keeps it quiet. However, Harold spots her. HAROLD: Gloria. I wonder if I might have a word with you. Now, please.